Environ’s range of hand held needling devices are designed to dramatically increase the effectiveness of Environ skin care products, and stimulate natural collagen production, through the creation of tiny micro-channels to allow improved penetration of vitamins into the active layers of the skin. There are two skin needling devices in the Environ range. The smallest is the Cosmetic Focus-CIT, which allows for skin needling in smaller areas, such as the frown lines around the middle of the eyebrows and crow’s feet. The larger of the two is the Cosmetic Roll-CIT, which is better for an all over skin needling experience. 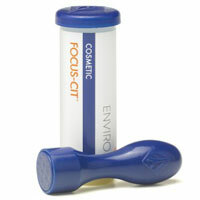 Using the Cosmetic Roll-CIT™, roll vertically, obliquely and horizontally, for approximately 3 minutes. Only to be used by those whose skin is already comfortable with C-Quence 2 or AVST 3. The instrument can be cleaned with warm water (after every treatment) and with the Roll-CIT™ Cleaning Solution once a week. Sunburn Alert: Use a broad spectrum sunscreen, wear protective clothing, and limit sun exposure while using this device. Benefits: Designed to help enhance the look and feel of your skin.